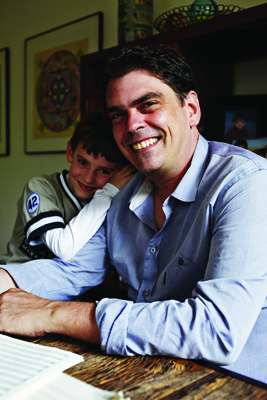 James Matheson ’92 shares a love of music and baseball with son Ezra, 7. James Matheson ’92 is driven to write music. He works out of his Brooklyn apartment, where he has a tiny studio containing an electric keyboard and a computer. A picture of modern American composer Charles Ives hangs on the wall. “It’s kind of cramped,” Matheson says. But not so his creative urge. Ideas for works originate at the keyboard or during walks through the streets close to his apartment, near Prospect Park. “I have been known to wander around looking a bit nuts, humming to myself,” he says. In 2011, Matheson received the coveted Charles Ives Living Award from the American Academy of Arts and Letters. The $200,000 award—for which artists must be nominated—is disbursed over two years, during which he can focus exclusively on composition. The son of a musical father who sings in a barbershop quartet, Matheson learned piano as a child (and, typically, hated practicing). As a teenager, he wrote songs and played guitar for a high-school rock band. Now a prominent composer of classical music, he has been producing commissioned works for such prestigious orchestras and music organizations as the Albany and Chicago Symphony orchestras, the Los Angeles and New York philharmonics, and the Borromeo and St. Lawrence string quartets. He’s currently composing a solo piano work for Los Angeles performer Nadia Shpachenko. Following in Matheson’s footsteps—at least for now—is his son, Ezra, 7. Like his dad, Ezra plays piano, enjoys improvising, but dislikes practicing. He’s off to a rock ’n’ roll summer camp this year. “We also play a lot of baseball,” Matheson says. Matheson arrived at Swarthmore from Des Moines, Iowa, with no clear direction. He enrolled in Gerald Levinson’s Music in the 20th Century course, not realizing that Levinson, also a renowned composer and the Jane Lang Professor of Music, would pass on to him a passion that would define the course of his life. Although the first two pieces he composed in Levinson’s course were “not very good,” he says, “they were enough to convince Jerry, in a particularly generous moment, to let me start taking composition lessons with him. That was where I first got the bug,” he says. In a later class, Matheson, who’d settled into a double major in music and philosophy, wrote a piece for nine instruments called Nonet. Levinson showed it to James Freeman, founder of the renowned Orchestra 2001—the College’s orchestra-in-residence—and they persuaded the music department to allow a reading of the piece. Matheson credits his success to Levinson’s mentoring and also to being the only Swarthmore student concentrating on composition in the music department at that time. In a few months, though, Matheson will turn his attention to a piece for chorus and orchestra he’s been commissioned to compose for Swarthmore’s 2014 sesquicentennial celebration. “I’m currently searching for a text for the choral part,” he says. “It has to be just right for the occasion. The deadline isn’t until the end of next summer, so I’m not panic-stricken yet, but if I haven’t figured it out by the end of the next two months, I will be,” he says.